"Our target is 180 thousand visitors during Christmas and New Year holidays "
South Jakarta Ragunan Zoo management has done preparation to welcome Christmas and New Year holidays. 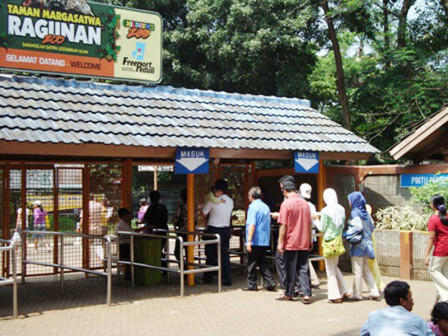 It is estimated around 180 thousand people will visit Ragunan Zoo. South Jakarta Ragunan Zoo Management Acting Head (Plt), Sabdo Kurnianto stated, 1,000 joint personnel will be provided to serve visitors who want to spend their holiday in this biggest zoo in Jakarta. "We have coordinated with Police, TNI and South Jakarta Government. They will prepare 1,000 personnel for service, security, and cleanliness," he added, Thursday (12/20). According to him, this year’s holiday period is started from December 24 to January 2, 2019. Based on last year's data, the number of visitors reached 100 thousand in Christmas and 160 thousand in New Year holidays. "Predictably its number will increase this year. Our target is 180 thousand visitors during Christmas and New Year holidays ," he expressed. Meanwhile, Ragunan Zoo is about to open all parking gates in south, north, west, and east to accommodate visitors' vehicles. "Those parking lots can accommodate 20,000 vehicles in total, both for motorcycles, cars, and even buses. We also prepare another parking lot inside if it is still not enough space," he explained. Currently, Ragunan Zoo has 2,160 animals in total. Entrance ticket for adult is Rp 4,000 and Rp 3,000 for children per person. While for parking ticket is Rp 3,000 for motorcycle; Rp 6,000 for car; Rp 12.500 for medium bus; Rp 15,000 for big bus; and Rp 1,000 for bicycle.